Pyrometer Calibrator. IR Blackbody calibrator. Gemini R 976. Pyrometer Calibrator. IR Blackbody calibrator. 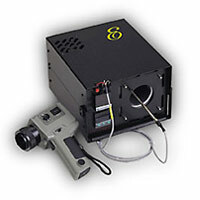 Gemini R 976 Blackbody Calibrator. Gemini R 976 Blackbody Calibrator radiation source. IR sensors, can be calibrated. With a temperature range of 50°C to 550°C, the temperature of the cavity can be set with 0.1°C resolution. provided for higher accuracy with a standard probe, which indicates the actual radiance temperature. a radiation thermometer directed into the cavity detects similar variations. R 976 Gemini R 976 Blackbody Calibrator radiation source. The Gemini R’s cavity’s size is 2.5” Ø x 6.3” deep (65mm x 160mm). Maximum temperature differences are ±1°C in the range of 100°C to 500°C. Typical fixed-point uncertainties are ±0.25°C. Gallium, indium, tin and zinc cells are available. for the built-in indicator and/or supplied probe. The Gemini R can be supplied with RS232 or RS422 communications.